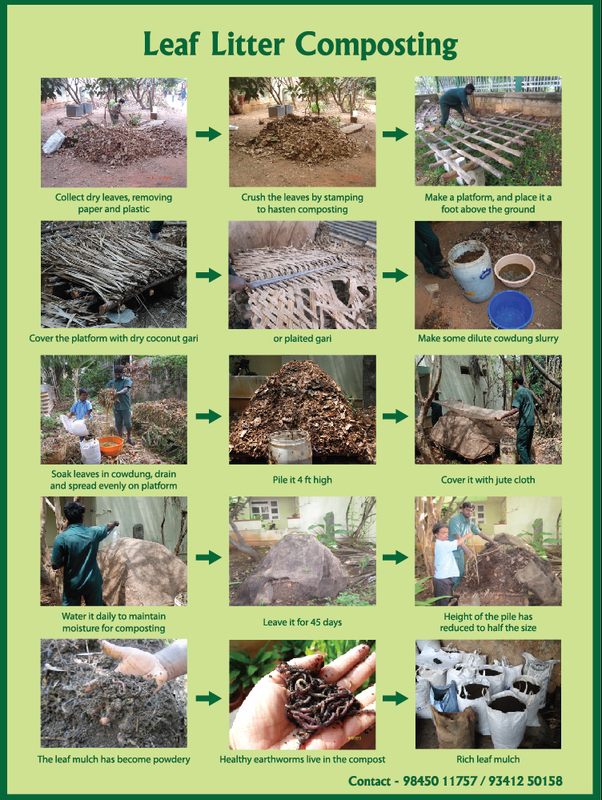 Quite a few community composting methods have evolved over the last few years, but I thought of kicking off this series with my personal favourite: Platform composting. That’s because it’s the easiest, the simplest, the most cost-effective and a hassle-free aerobic solution to compost both your kitchen and garden waste. For a case study, I didn’t have to look beyond Malleswaram where eco activist Dr Meenakshi Bharath has been using this method successfully for the last 4.5 years. This method works both at individual and community levels quite effectively. In short, it’s easily scalable at a minute cost. Ideally, to speed up decomposition, a shredder is a must for all types of composting. It takes care of the physical breakdown of the raw material and reduces the turnaround time significantly. That also means saving space, labour, energy and of course, cost. Otherwise, large watermelon, pumpkin pieces and even citrus peels take a lot of time to decompose, thereby slowing down the entire process. As the name suggests, you have to put together a platform using cement blocks, wooden logs and coconut branches to provide a one-foot-high gap between the platform and the ground so that the leachate that trickles down is quickly absorbed by the ground beneath and air travels up the pile from the bottom. The only accelerator needed here is cow dung. You could also use sour curd to introduce beneficial bacteria into the pile. A shredder (please Google for various types of shredders) comes at various sizes and costs. Pick the one keeping in mind the quantity of the waste to be composted. For the platform, you will not need more than a couple of thousands of rupees. The only operational cost here is cow dung and of course, power expenditure if you are using a shredder. Step 1: You will need wooden poles—preferably sarve mara; if not available, go for bamboo or eucalyptus. They come in lengths of 12 ft and can be cut into 3ft-4 ft or 6 ft long. These poles have a long life, up to five years. Step 2: About a dozen size stones or cement blocks are needed to make the base. Step 3: Use coconut fronds or palm leaves and spread them on the wooden poles placed in a grid-lock fashion. This acts as a base that holds the leaf litter or food waste from falling down. Step 4: Shred the waste. It reduces the volume by more than half and speeds up the decomposition process. Step 5: Prepare slurry using cow dung that’s a few days old. Two handfuls of cow dung in a bucketful of water is a minimum requirement. Dip the food and garden waste into the slurry so that all sides get coated with it. If not, sprinkle sufficient amount of slurry on the waste uniformly and turn it a bit using a rake. Step 6: Water the bed thoroughly and cover the pile with jute cloth to control moisture evaporation. You can prepare the bed all at once or day by day depending on the quantity of waste generated. Step 7: Earthworms enter the pile on their own. Step 8: Mature, sweet-smelling compost ready to be used for the garden. What you see here is shredded waste which needs no sieving. Once you shred the waste, spread it on the platform after you dip the waste into cow dung slurry. No need to rack your brains over extra moisture as it drips down without any hassle. Go on piling it up till it reaches around a four-foot height (a little higher if the waste is not shredded). You could use a jute cloth or a shade net to cover the pile to reduce moisture evaporation. It takes about two months for the entire pile to turn into wonderful compost. If you have not used a shredder, then it may take longer and you will have to sieve the compost, take out the semi-done compost and put it into a new pile. Odour was not an issue at all at Dr Meenakshi’s backyard. But she insists that if you mix both kitchen and garden waste, then adding sufficient cow dung is a must. Otherwise, food waste can certainly create odour issues. I saw no cockroaches or flies over the pile which was left uncovered. If anything, it was that sweet, earthy smell emanating from two piles. As you can see in the pictures, earthworms, attracted to the cow dung, enter the pile on their own and multiply at their own pace. If you have ensured proper moisture and sufficient cow dung, you will see ceaseless earthworm movement—a sign that all your efforts have been simply worth it. Aesthetics is a subjective issue and each one of us has our own idea of it. In fact, how we look at composting—a natural process that goes on silently in the world around us—actually lays bare how evolved our mindsets are. For someone like Dr Meenakshi, the sight is not a problem at all as she looks at this silent process where precious resource gets transformed into nutrient-rich organic manure as a beautiful activity that helps one move closer to nature. But things can get tricky if you want to execute it in a gated community or an apartment complex. In that case, moving this activity into a well-ventilated room can be a good idea. Else, carving out some space where the piles can be hidden using a shade net or even plastic sheets takes away all your worries. Dr Meenakshi Bharath in her garden which thrives on home-made compost. All the papaya, avocado and coconut trees; tomato, cabbage and cauliflower, and various creepers like basale, bitter gourd and ridged gourd growing so nicely in her garden further bolster her firm belief: “Nature is the best judge”. So, if you have some space, a shredder and supply of enough cow dung, just get going. Shred it, spread it and forget it. This entry was posted in Community Composting, Endlessly Green and tagged Community composting methods, platform composting. Bookmark the permalink. Post was very informative . Every household in our area want the trees to be cut of as they feel the falling dry leaves are a nuisance. Dry leaf compositing is a good idea hope to try it soon. Can’t believe people want to cut the trees because they find the leaf litter an issue to handle! Just irrational! The best was this one “Let’s cut trees because we have water shortage”. Well he din’t realize that Trees bring rains! where can i buy these type of leaf shredder and how much ? Dear Arun, Dr Meenakshi Bharath uses Trapp shredders from Brasil for the last 2 yrs. She says, she “found it best, easy to.use and very little maintainance”. “It’s like caring for your mixi”. I read up on the platform composting for the second time. can’t believe it is so simple and so low on infrastructure requirement. I have just one doubt. We are a fairly large residential complex. We do get lot of garden waste which we can store/dry and shred and do platform composting. But how do we pile up kitchen waste? They should be done with the same day, right? Should we have a parallel composting activity for daily composting of kitchen waste? Dear Kamala, You don’t need to create a pile all at once. You can go on adding day by day. But even if you want to, it can be done with only garden waste and NOT kitchen waste as you rightly said. I suggest that you stick to this only to compost your garden waste. Once you get a hang of it, you can then start with a small pile where you can throw in a small portion of kitchen waste, too. It will be too much for you to handle given the huge quantities of waste your community generates. 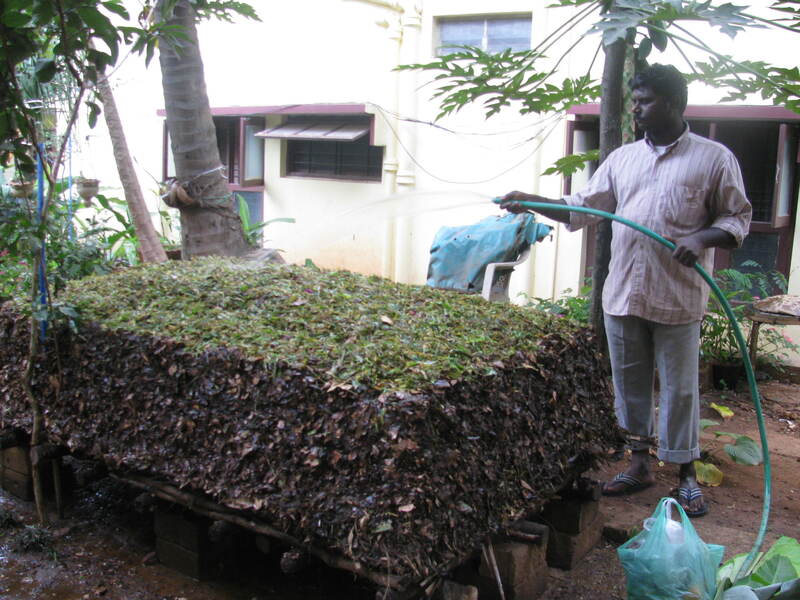 We generate a lot of dry leaves in our garden and a lot constitutes bamboo leaves, I hope to use the method prescribed by you but my doubt is where is this shredder available in Bangalore?? 1. In this method, how is aeration done in the middle of the pile? I don’t see any raking happening. Is it because of the slurry that aeration is not necessary? 2. In all composting methods, we have always learnt about keeping the moisture content correctly and any excess moisture leads to odour due to anaerobic activity. But here it seems contrary and we seem to be dipping the waste in excess of slurry. If we add slurry, does it mean I don’t need to worry about the moisture level at all as long as they leach down? 1. In this method, how do we ensure aeration of the entire pile because there is no raking happening? Or is raking not necessary because we are using slurry or because we are shredding the waste? 2. In all other composting methods, we have always been worried about excess moisture leading to anaerobic conditions and odour. However, here we seem to be not worried about excess moisture and allow them to leach through. Why is odour and moisture not a problem here? Hi how much food and garden waste can be processed in each pile? Or put another way, how many households can one pile serve? Thanks! Hi Joi, sorry, I don’t have this data at this moment. Will check and get back to you. Thank you.